On the sleep front last night was much better. It was a very cold night, ice on the inside of the tent, but I was OK inside my sleeping, used the fleece liner for the first time and it certainly improved things. Still I don't think my sleeping bag is good enough for the 5,000 plus metre nights and if I can hire a 5 season bag at Tangnag I will do. Today's walk marks the end of the pre-climb training week. 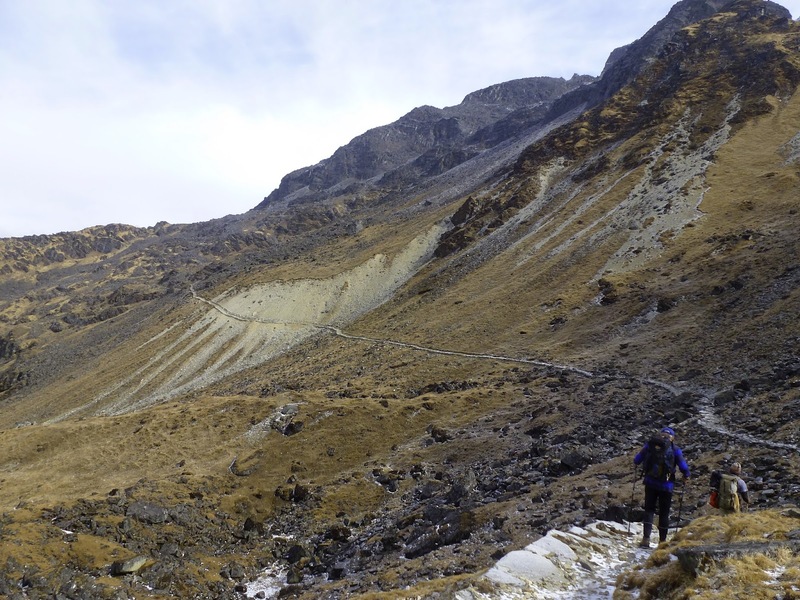 The Exodus itinerary takes you on a long detour away from the direct route to Mera and is designed to avoid the steep climb out of Lukla and gives more time to toughen up before the main climb. I think this makes a lot of sense and even though I did the Annapurna I feel a lot stronger. We hit the main trail again today and next week is all about preparing for the summit. Lovely walk today although it snowed again at mid-day. 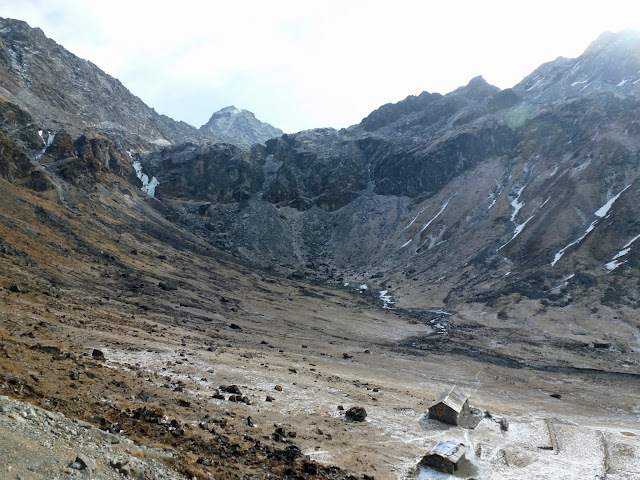 A sharp 300 metre climb up from the camp site was followed by a long contour path high up the side of the valley. Ahead of us we could see Mt Gongilla and behind us the sacred lakes we visited yesterday. It was fine walking on really well maintained paths, paths which are apparently maintained by a combination of the contributions from the villagers and tea house owners, it's a system that clearly works. We then dropped down sharply through rhododendrons trees into a steep sided valley. With the snow on the ground the going was treacherous and a number of people lost their footing. We had our first lunch cooked out of doors. On previous trips this has been standard but, because of the number of tea houses on the route, the cook team has been able set up near these and we usually eat indoors. Lunch didn't take long as it started to snow just as we started eating it. The food by the way has been very good and there is definitely no need to go hungry. It's high on carbs and there is often an odd mix of items but it's good none the less. There is always soup, then four fairly randomly chosen items (e.g roast potatoes, noodles, greens, tinned tuna) and then some tinned fruit to finish. Last night we had a cake for desert, a sort of steamed cake and it was really good. Although the food on all the trips is similar the food on this one is the best I've had. 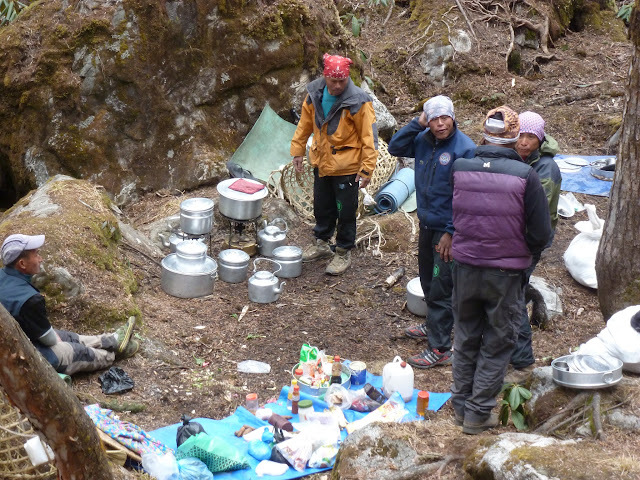 The cook is the uncle of Himelta, the lead guide on the Annapurna Circuit. The cook has a special status and in particular it's noticeable that he is not expected to carry anything. After going through some more rhododendron trees we dropped down into a wider valley strewn with bolders, clearly the remains of an old glacier. Old craggy pines now dominate the hill sides and like everything else these are covered in moss and lichen. After about an hour and a half after lunch we arrive at Kote. 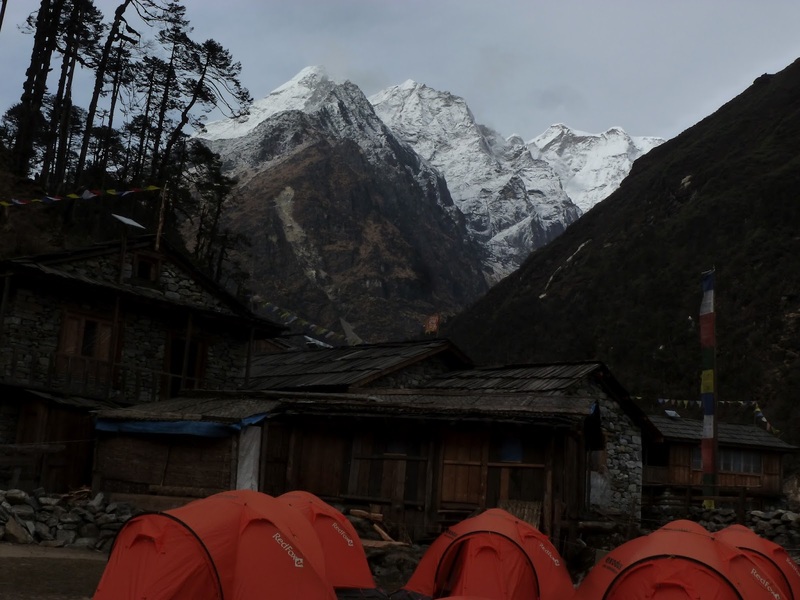 The snow had stopped, the tea house has a fire and high up the valley, for the first time in three days we get to see Mera Peak. It will be the only real focus of attention for the next six days.